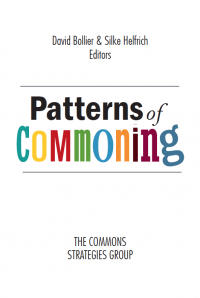 This blog post continues the one started yesterday — a report on the future of the commons as discussed by the commoners who met at Crottorf Castle in Germany, in June 2009. 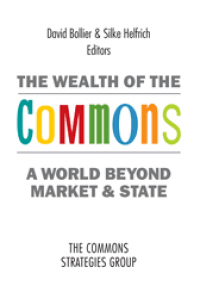 Stefan Meretz (Keimform blog, Berlin, Germany) proposed that the commons represents a qualitatively new step in history. The core problem is to overcome the classical market economy’s power to order most of life. Why should the formal economy, which governs approximately one-third of the world’s resources (by the reckoning of one study), control the other two-thirds of the world’s resources? A central problem in modern life is that our economic relations to each other govern our social relations. Our identities as employees and consumers predominate, and so the marketplace becomes our primary source of social and personal meaning. Market production dominates society, and the value of anything is determined by the price it can command. The main question for any endeavor is whether its output can be sold, not whether it has intrinsic value to human or ecological well-being. 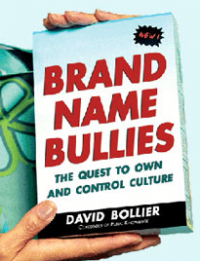 Our relationships end up being indirectly mediated by products and things. The commons paradigm challenges this paradigm of neoliberal capitalism by introducing direct social production. Individuals know their own needs, by themselves, and can self-select tasks that engage their talents and passions. Socially based production in this scenario becomes the basis of social relationships; the making of a livelihood (money from the market economy) blends with the making of a life (purpose and meaning). Meretz bases much of his analysis on the social dynamics of free software development, a process that depends upon self-directed, passionate, voluntary engagement in a collective production process. Meretz sees this paradigm, which has been pioneered by free software, as the harbinger of an epochal shift in the economy. 1. People begin to identify the seed forms of new modes of producing our livelihoods. This will occur in “secured places” where commoners can experiment and build new models without interference. 2. A crisis in existing production modes will allow the new seed forms of commoning to grow and become an historical force. 3. Niche modes of commoning will expand and become a relevant force in the economy and society at large. 4. 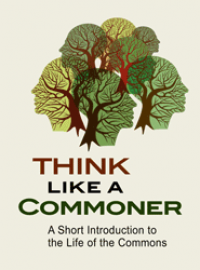 New modes of commoning will become dominant and replace the old logic of neoliberalism with a new logic of the commons. 5. The new institutions and production practices will consolidate and realign themselves over time. Strictly speaking, commons used in a business context are not necessarily about maximizing profit. Yet they are valued nonetheless because they help companies “solve” their competitive challenges. Think of large tech and media companies that rely on user-generated content or free content to attract Web traffic, market their brands, and earn advertising revenues. The commons, in other words, can be tolerated by profit-seeking companies, or in many instances, provide genuine competitive advantages. But what is significant from the commoners’ perspective is that commons-based production cannot be absorbed by the market system. It is a protected zone of endeavor. As such, this stage represents a inflection point that allows the commons to take root in the neoliberal system without being violently rejected by it (which would otherwise be the expected response). Over time, the deficiencies of the old neoliberal system will become evident; the system will lose its strength and stability; and it will be supplanted by a commons sector that will out-perform it with its own, quite different logic. This is Meretz’s theory of how the commons can develop from within a hostile neoliberal environment. At Stage 3, a shift in logic occurs, said Meretz. The market typically requires competition at the expense of others. My success in producing a higher-quality product or more productive process means a loss for someone else. This is not a personal thing. It is just a systemic feature of the market capitalism. It is a structural relationship that we cannot overcome individually. By contrast, a commons allows value to be produced only if others are participating. This dynamic is based upon an elemental principle of human life: self-development requires other people, in the positive sense. Without a community, nothing is possible. Again, this idea is grounded in the empirical realities of free software. One version of the Linux operating system is Ubuntu, an African term that comes from the phrase, “umuntu ngumuntu ngabantu,” which can be roughly translated as “A person is a person through other people” or “I am what I am because of you.” This principle is intrinsic to so much song, dance and music in Africa, where all individuals in a community are involved in the process of creation. The commons induces a positive feedback cycle of “I need others and others need me,” said Meretz. This can be seen in numerous online communities. If others do not come forward to co-create, then it’s not a commons. George Caffentzis suggested that just as Machiavelli described the transition from feudalism to capitalism, so we may need “a new Machiavelli” for our times to help describe the transition from capitalism to the commons. Michel Bauwens of the Peer to Peer Foundation (Bangkok, Thailand) made a presentation about the self-organizing capacities of people on the Internet, often known as commons-based peer production. It is significant that Web 2.0 software took off just as the tech industry crashed, in April 2000, he said. Investors fled the field and refused to provide capital. Yet a single individual working without staff or capital, Bram Cohen, was able to build and launch BitTorrent, a peer-to-peer file-sharing software that has dramatically lowered transaction and coordination costs among people. BitTorrent has become a key tool for many legitimate scientific, business and commons enterprises (as well as illegal music file-sharing). The success of BitTorrent and other commons-based systems implies “a revolution in organization and value systems,” said Bauwens. “We are not going back to pre-modern holism. Relationalism is the future.” By this, he means that “affinity-based communities based on a sense of belonging” are the archetype for the future. Production will become a goal-driven affair among participants who jointly negotiate understandings among themselves. It is now customary for for-benefit associations to guide and assist the social/technological innovation of volunteer-driven communities, often by raising and allocating money to specific projects. Most of the major free and open source software projects — Linux, Apache, Ubuntu, Debian, Wikipedia, etc. — have affiliated software foundations. The foundations do not direct the course of software development, but they do provide critical funding for the infrastructure of cooperation. Yet another layer of institutions frequently arise “on top of” the software commons — an ecosystem of businesses that interact symbiotically and respectfully with the various communities. Bauwens asserts that commons-based peer governance and production will tend to prevail over closed, proprietary business systems. He argues that companies that open up their organizations will out-compete and out-cooperate closed companies in the marketplace. Alliances of open projects will prevail against closed systems as well. It appears that conventional markets do not work well in a field of non-rival goods (“free information”) that is the norm on the Internet, said Bauwens. Such companies can only make money by working at the margins of open communities. Industry analysts point out that even companies with enormous market capitalizations such as YouTube, Facebook and Twitter do not earn substantial profits (yet). Besides inaugurating a new organizational form, peer production has historic significance in the history of capitalism. “Capitalism cannot reproduce social relations or society any longer,” noted Franz Nahrada. The social order need not be entirely submissive to the masters of economic production; they have protectible commons. 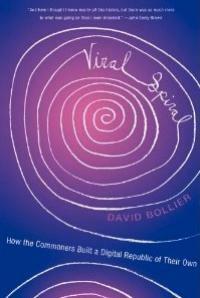 This is the general theme of Bollier’s book, Viral Spiral: How the Commoners Built a Digital Republic of Their Own. The book describes how loosely federated tribes of commoners have built a quasi-sovereign system of technological infrastructure, legal licenses and social ethics to govern themselves. They are able to control and manage the resources that they generate. This can be seen in remix music and video mashup communities; in the many creative sectors and scholarly disciplines that use Creative Commons licenses to create viable commons of creative works and information; in the proliferation of open education and open science project-communities; and in new forms of citizen affinity groups that self-organize to advocate their own causes. 7. A Divide Between Digital Commons and Physical Commons? A number of participants questioned whether digital commons on the Internet truly have much in common with natural resource commons. After all, the “two cultures” — digital and physical — do not appear to have much to do with each other. 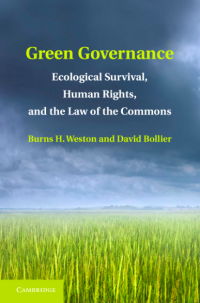 Moreover, natural resources are finite or depletable, unlike digital resources, and so the management strategies and politics of these two broad classes of commons are quite different. Richard Pithouse of Port Elisabeth, South Africa, pointed out that among the squatters and other urban activists with whom he works, “online practices are seen as exclusionary.” Most people do not have email accounts, and any collective projects require in-person meetings after work hours. Much of the global South does not have easy or cheap access to the Internet, and rates of Internet access vary even in industrialized countries based on one’s age cohort, ethnic background and income. And yet the digital and physical commons are interconnected. The infrastructure of computer and communications lines are physical products that must be built, and that have environmental impacts. The two realms are integrated in another sense, through culture. We bring our cultural worldview and relationships to our dealings with the digital commons as well as with natural resource commons. Significantly, there are some intriguing bridges being built between the two. Rainer Kuhlen of the University of Konstanz in Berlin, cited the case of community gardeners using electronic technology to manage their shared gardens. The Transition Towns movement is another example. More than 150 towns around the world are trying to re-invent their local economies and cultures in order to anticipate the coming impacts of climate change and Peak Oil. These communities use digital technologies to communicate collaborate and share with each other. Franz Nahrada of Vienna, Austria, founded the Global Villages Network in order to link together a worldwide community of village-based innovators. He cited instances of communities using digital technologies to improve their economic autonomy and improve their stewardship of the environment. Nahrada cited instances of visionary design that show the full potential of integration of human habitat into the environment, if treated as commons. The communities would maintain themselves largely by leveraging connections to knowledge and knowhow (maybe some still aggregated in urban nodes) relayed by information technologies. In this way people would maintain connections to their larger urban, global and cultural millieu while on the other side strongly and intensively interacting with their immediate natural environment. The aggregate effect would be to foster planetary stewardship. One compelling and iconic yet very utopian example is Vincent Callebaut’s “Lilypads” project, in which cities would freely float in the oceans while having a flower-like, symbiotic relationship with the water world. Another model is Arcosanti, which would reduce the size of human habitat into three-dimensional structures (arcologies) and reduce the waste of time and energy of single-family homes, re-opening vast suburban land to the public while taking care of it. John Lyle at Pomona College has proposed another way of integrating living systems with architecture and habitat in his landlab. John Todd of New Alchemy built the archetypical “bloodstream” of water acting as material carrier of nutriients and waste between organically connected community functions. “Village Towns,” by Claude Lewenz, are built around plazas, making the common place the centerpiece of habitat. Michel Bauwens gives a glimpse of the under-leveraged synergies of technology and local communities in an essay, “Russia and the Next Long Wave, and Why Its Agricultural Villages Are Important” (http://globalvillages.ning.com/profiles/blogs/russia-and-the-next-long-wave). Bauwens notes that the open design principles of free and open source software have profound implications for local communities as they try to gain greater control of their economic and cultural lives. Another vision for connecting the digital commons with the physical environment is set forth by Christian Siefkes in his 2007 book, From Exchange to Contributions: Generalizing Peer Production into the Physical World. Siefkes, a computer scientist from the Freie UniversitÃ¤t Berlin, is Co-founder of the Keimform-Blog (http://www.keimform.de), which investigates how far the potential of commons-based peer production extends. Siefkes’ book offers an ambitious theoretical framework for building a “peer economy” in physical contexts by generalizing the principles of peer production. He addresses such basic issues as coordinating the producer side with the consumer side, resource allocation, decision-making, management challenges and maintaining peer production as a separate realm from the market economy. Pat Mooney, Executive Director of the ETC Group, summarized some of the leading work that he and his colleagues are doing to fight enclosures of “bytes,atoms, nano-matter and geology,” or what he expresses with the acronym “BANG.” Mooney painted a sobering picture of just how far enclosures are proceeding as a result of corporate consolidation, cutting-edge technologies, stricter intellectual property laws and corporate-state partnerships. “Industry concentration is driving a huge loss of biodiversity,” he said, noting that 75% of seed stock diversity is now eroded. In 1977, there were 7,000 seed companies in the world. Now, only ten companies control almost 70% of the global seed market. Three companies — Monsanto, Dupont and Syngenta — control half of the market. This market consolidation has in turn greatly strengthened the political power of seed and agricultural companies, who frequently dominate legislative and regulatory debates that seek to contain the risks of these new technologies. The ETC Group is concerned about a number of other profound enclosures-in-progress. These involve matter at the atomic level; the invention and ownership of new types of self-replicating lifeforms; and the integrity of basic geological conditions on Earth. Nanotechnology, for example, is an attempt to build new types of matter, atom by atom. The idea is that synthetically engineered matter can be made more efficiently and with less waste than natural materials. Nickel might be altered to be a cheaper commercial substitute for platinum, for example, and sand might be modified to perform as a cheaper substitute for copper (both developments that would be hugely disruptive to the economies of nations that now mine these metals). Already Harvard University holds patents on 23 elements of the Periodic Table to use at the nano-level, said Mooney. By 2015, Mooney estimates that there will be a $2.5 trillion market for nano-engineered components. What’s worrisome about these developments is that even scientists do not really know the implications of altering the commons at the level of the Periodic Table. There are also potential weapons applications of the technology, such as a “nano bomb” that could explode nine city blocks, said Mooney. Synthetic biology is another frontier enclosure. In this case, patents may not even be able to control the proliferation of homegrown DNA-splicing because there are “open source” methods that are evolving. This raises the question of whether “Do It Yourself (DIY) DNA” could be adequately policed by its participants. Here again, the biggest chemical and energy companies are heavily involved in developing this technology. It has been calculated that “only 23.8% of the Earth’s biomass is capable of being commodified at this point,” said Mooney; synthetic biology aspires to expand industry access to the remaining three-fourths of the commons is not yet technically accessible. Yet another frontier of market enclosure is geo-engineering, which is increasingly being considered as a way to deal with global warming. Some scientists are proposing changing the surface of the oceans to make them less reflective, for example. Another proposal would blow salt into the stratosphere to create a “solar screen” to ward off the sun’s heat. The obvious dangers are tinkering with the Earth’s basic ecosystems; no one really knows what might happen if the basic processes of the oceans and stratosphere were altered. The commons may be a useful concept to defend against these and other enclosures, said Mooney, because it offers a defense against the primitive accumulation of those in power. It helps assert the intrinsic value of such elemental commons as food crops, biodiversity, the stratosphere and the Periodic Table of matter. Tomorrow: the rest of the report on the Crottorf retreat.